The Discovery is our most addictive puzzle creation yet! As a progressively challenging solitaire activity it was singled out from the Tantrix Game Pack to provide the perfect introduction to Tantrix. The concept is simple: Ten tiles numbered on the reverse from 1 to 10. Start with three tiles, then slowly increase the difficulty by adding more tiles - it's guaranteed to hook you. 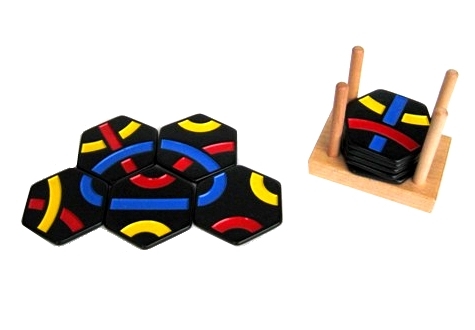 Contains 10 hexagonal tiles in a wood stand. The puzzle is designed to sit on your coffee table and drive your guests to distraction. The Discovery is the best way to learn about Tantrix concepts and improve your spatial skills. This is the one to start with! This product was added to our catalog on 17.06.2008.